This morning, I was hanging out with my 3 year old buddy, Josh, and decided we should spend some time playing with the computer. My first attempt to entertain him was with Tuxpaint. That only went so-so. So, I decided to go for plan B. I asked him what his favorite truck was, hoping to bring up some photos on flickr. Again, that only kept him entertained for a minute or two. Finally, he told me that his favorite car was Lightning McQueen. 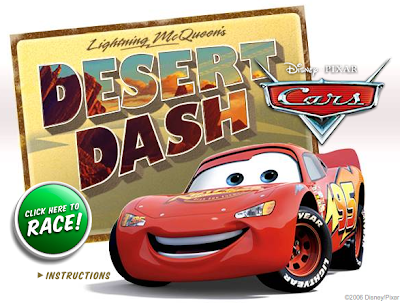 A quick Google search found me the free and instantly usable Cars: Lightning McQueen's Desert Dash game. It took Josh about 30 seconds to figure out how to control the car, and he was in heaven. Home run. We poked around dan-dare.org and there are other games that Josh found fun, like the Nintendo Super Mario Brother's Game(the original one, implemented as a 2.9meg flash file - how sweet is that?) and others. Though we kept coming back to the race car game. If you're looking for a source of kids games, you should definitely check the site out. I'm sure that most of them aren't ideal for your 3 year old - so use your judgment (and I don't have kids, so what the heck do I know!). But they are free, and easy to use. Another activity Josh really enjoyed was watching the space shuttle launch. this video was especially fun as it has the ever-important count down sequence. Bike Games, Car Games, Parking Games, Truck Games, Mario Games, Sonic Games, and some other girl sites: Fun Girl Games, Bratz Games, Girl Games, Makeover Games.